Sherry Thurner. 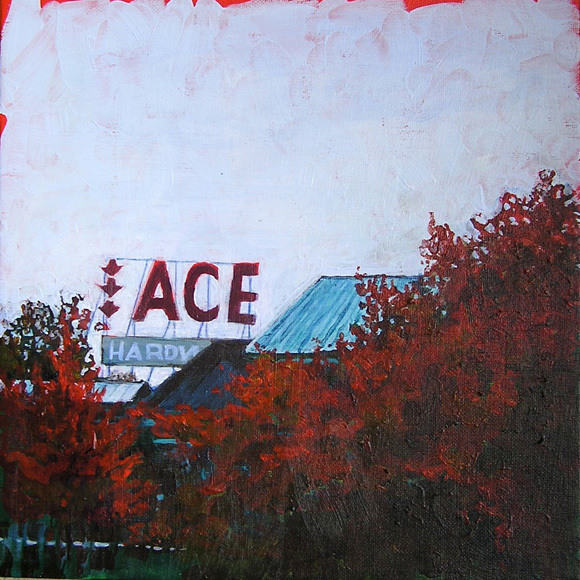 Ace Hardware (acrylic; Janesville, Wisconsin; 2009). Theaster Gates, his True Value (2016); here also. Image from page 241 of this book. While Jerry contemplates bolt length, Oswald eyes the Van Boodles, a wealthy couple (Mr Van Boodle is owner of the beet sugar works) who are looking over color television sets... (shown here without permission, for now). 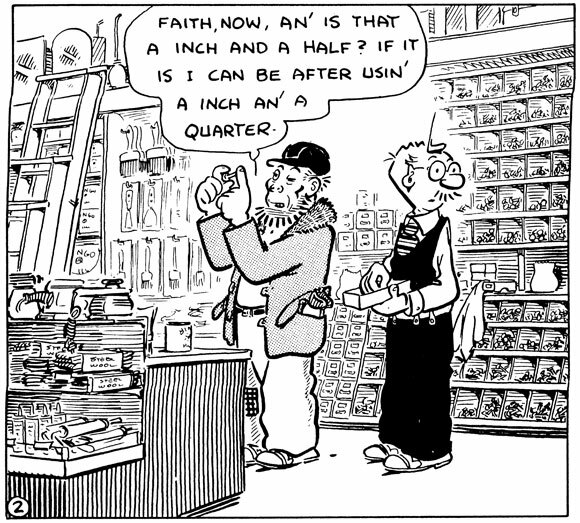 Mister Oswald ran for many years in the trade magazine Hardware Retailer. Rob Stolzer’s illustrated interview with Russ Johnson can be found at Hogan’s Alley : online magazine of cartooon arts. See also Stolzer’s fine Russ Johnson gallery page. Charles Austin Bates (1866-1936), editor. The Hardware Book (New York: The Charles Austin Bates Syndicate, 1899). The Open Library page for this book provides access to pdf, the Internet Archive page, and to LC metadata. Purchase of (subscription to) the book entitled one to other services, including (1) a letter of criticism and advice; (2) a plan for changing from credit to cash; (3) subscription to Good Advertising for one year; (4) a book of store rules such as are used by leading houses ; (5) subscription to The Show Window for three months; (6) 225 coupons, each entitling the holder to purchase one single, or half-column, wood-base cut at sixteen (16) cents and postage. Pages 3-19 are introductory (bromides, discussion of importance of advertising); followed by Ready-Made Ads for Busy Merchants (148 recto pages, all but the last six of which show one cut and accompanying copy per page); followed by Catch-Lines and Headings, clipped from various sources (13 recto pages); followed by Record of Advertising Contracts (8 recto pages); followed by Daily Sales and Advertising Record (13 recto pages). Bates’s business was prolific, and warrants further investigation. It was a so-called non-placing agency in that it generated copy and art, but did not place the ads (which ultimately wasn’t an efficient model for advertisers). (See Yerodin Sekou Bermiss, The Emergence and Evolution of Professional Service Industries (Northwestern University dissertation, 2009), p70). Ad Age provides a paragraph-length bio here. 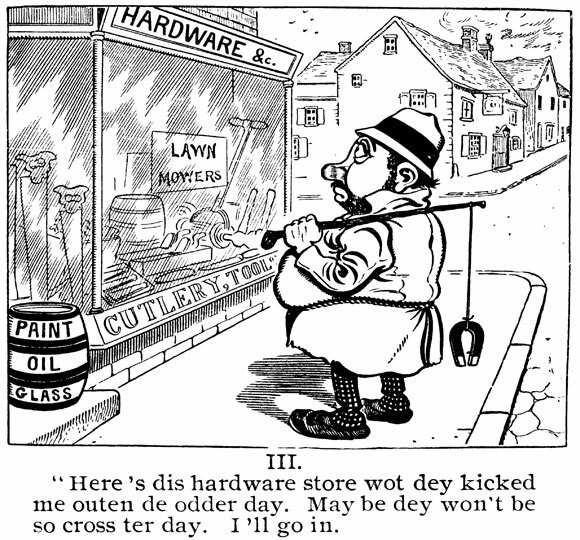 The Bates art brings to mind R. F. Outcault, specifically his Ad cuts for hardware and sporting goods (copyrighted 1914), listed (though alas not illustrated) here. 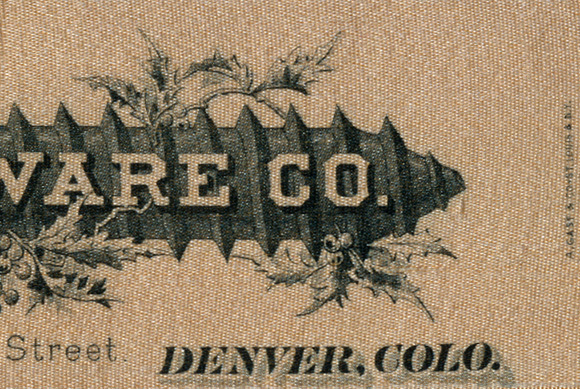 bookmark, 11.25 x 2 inches, The Boettcher Hardware Co., Denver, Colorado. printed by A. Gast & Co., St. Louis & N.Y.
Boettcher Hardware Company was founded in 1884 by German immigrant and Colorado entrepreneur Charles Boettcher. The new firm was not Boettcher’s first hardware business — he had operated others in various mining settlements. In this case, he purchased an existing wholesale hardware business, and moved it to 402 Lawrence Street in January 1885. 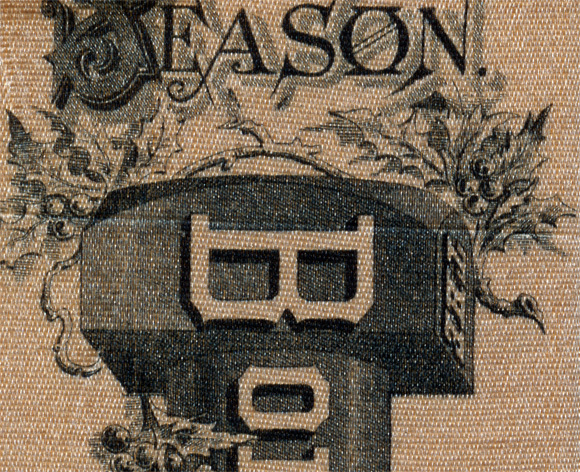 (Geraldine B. Bean, Charles Boettcher: A Study in Pioneer Western Enterprise (Boulder, Colorado: Westview, 1976): 92.
bookmark, detail, The Boettcher Hardware Co., Denver, Colorado. A. Gast & Co. was a printer of checks and banknotes. The printing was apparently from stone, possibly via transfer from an etching. The offsets under Denver, Colo. and Season appear to be intentional. Thanks to Robin Bledsoe, Bookseller (specializing in horses) for this find! And to David Whitesell and Lauren Hewes at the American Antiquarian Society (Worcester, Mass. ), and to Alastair Johnston and Frances Butler for their advice re: the printing. The characters expressing a Buddhist prayer are formed from representations of carpenters’ tools. Title from Hābādo Daigaku Yenchen Toshokan shozō Burūno Petsōrudo kyūzō shiryō (jikusō, kansusō) mokuroku = Catalog of scrolls in the Bruno Petzold Collection preserved at the Harvard-Yenching Library published by Nichirenshū, edited by Prof. Annaka Naofumi and Sasaoka Naomi, 2011. 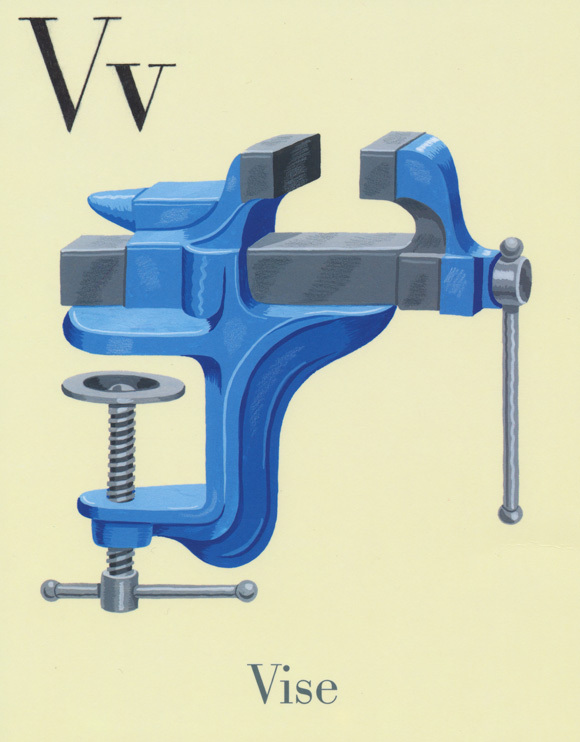 Lettering associated with tools and hardware stores, including signs, deserves its own special section (and book). Taken from Cole Hardware’s posterous page, and shown here with kind permission from Cole. The goal is to make our windows 99% hardware. 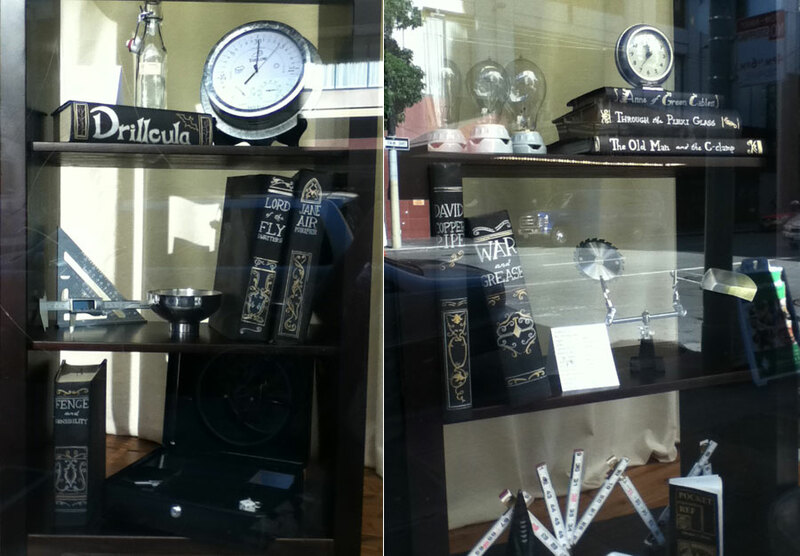 Everything in the windows, including backdrop, flooring, trim and display units is from the store. Curtains are made from drop cloths and wall coverings from asphalt paper. Juliana Brodsky shows Cole’s Halloween window (October 2011) — entire and details — here, and makes the connection to the board game Clue. Book-related details from her presentation are shown below. I show the book covers, from Noell’s Halloween windows at Cole Hardware, because they connect with the overall theme of these pages — hardware store literature. There is more to be seen both at Brodsky’s blog, and at Cole Hardware’s own windows page at posterous. Will be sure to visit Cole on my next trip west. More about the Curator of All Things Hardware here (SFGate/Chronicle, November 30, 2009). Sandra D. Crandall, cover art. 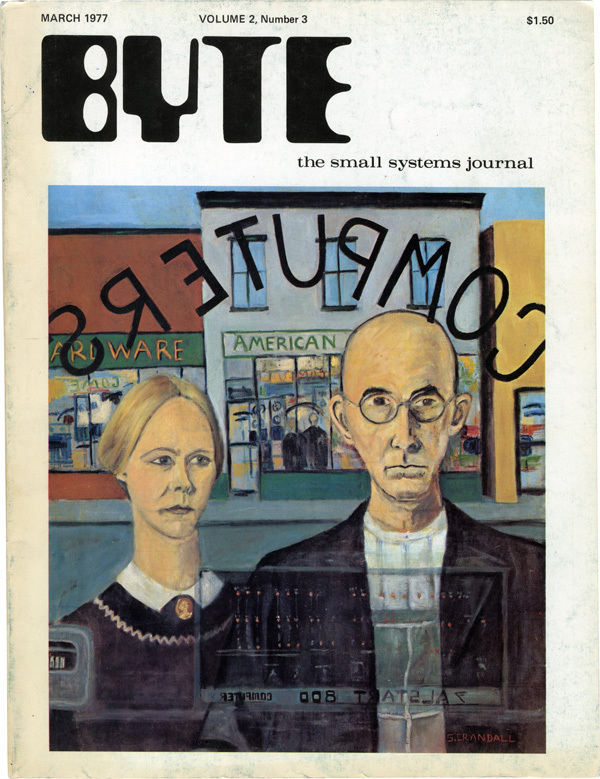 cover, BYTE Magazine Vol. 2, No. 2 (March 1977), illustration by Sandra D. Crandall. This month’s cover is by Sandra D. Crandall, Narragansett, RI... When she painted her updated American Gothic, she was completing her BFA in Art at the University of Rhode Island, and as assistant Art Department slide curator, maintained a library of over 40,000 slides. My fiance [sic] is finishing his BS in Computer Science and is an avid BYTE subscriber from the word go, she said. No luck in tracking the artist down, to ask for permission to show here. Crest Hardware in Williamsburg, Brooklyn makes room, amongst its mundane inventory, for an exhibit of tool-related art that in summer 2009 observed its eighth year. Read about it here (The New York Times, 6 July 2008). interview with Joseph Franquinha, Crest Hardware (Gothamist Blog). Described, and some scanned pages, here. We’ve seen that notion of eyeing and purchasing tools that will never be used, elsewhere in the literature, e.g., Phyllis McGinley her Please Lock the Hardware Store, or The Temptations of Oliver James (here). An illustrated day-in-the-life look at Little Town, from One o’clock and all’s well to midnight and all’s well in Little Town. Lovely, detailed illustrations evenly balanced (space-wise) by text, throughout. Arrangement of merchandise is haphazard — saws above seeds; chisels, planes and pliers next to pots and kettles, and above garden hoses — but suits the music of the prose. There’s a mix of line drawing, inking and stippling throughout, along with several color illustrations. This is a wonderful volume. One bookdealer’s description says it portrays Nyack, New York (maybe from evidence on dust jacket, or because the Haders lived nearby?). Details of many shop and other interiors, street scenes, etc. 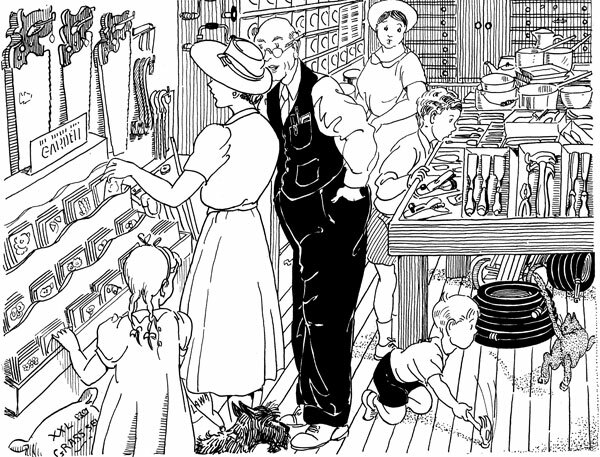 The interior of the Ten Cent Store shows a black woman and her son, among other customers (but not at the lunch counter). Some scenes that one might expect to find, are missing — a school room, the interior of a church — but not missed! A minor note is quietly struck by mention of old Captain Tom, who had piloted the ferry across the river for more than fifty years. The bells toll softly for him in the little chapel over the hill. Berta and Elmer Hader were prolific (illustrating 70 books, of which they wrote about half, according to wikipedia). Indeed, a fascinating pair, the subject of the Hader Collection (opens to their links page), and a biography under way by Sybilla A. Cook, provisionally entitled Drawn Together. Great illustrations, in my book, because there’s so much to look at in them, so much to see. 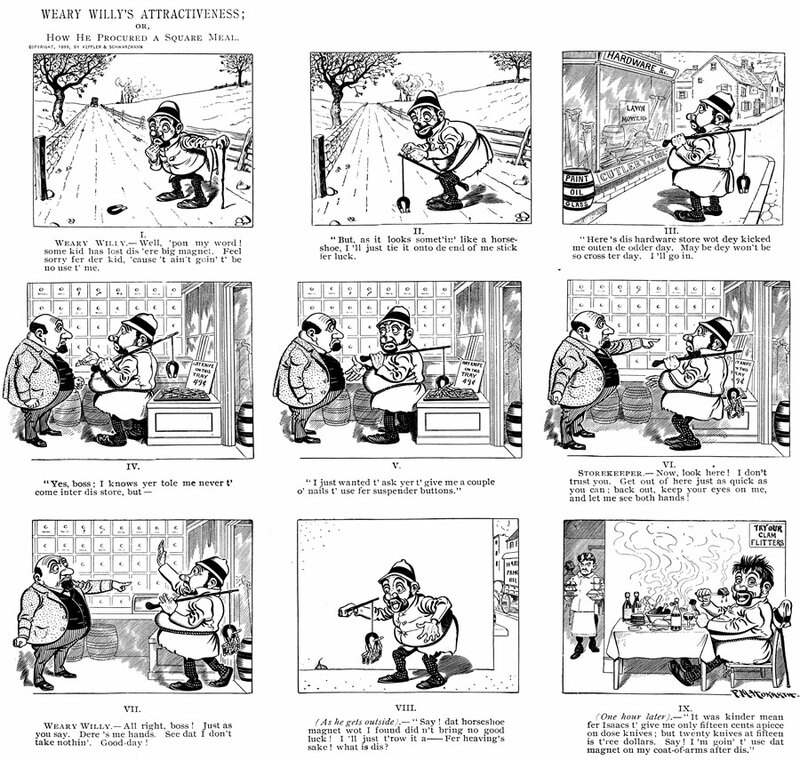 The full nine panels, rearranged for this page, are shown below at a smaller size. Franklin Morris Howarth (1864?-1908). A self-portrait, and a word on his method can be found here. 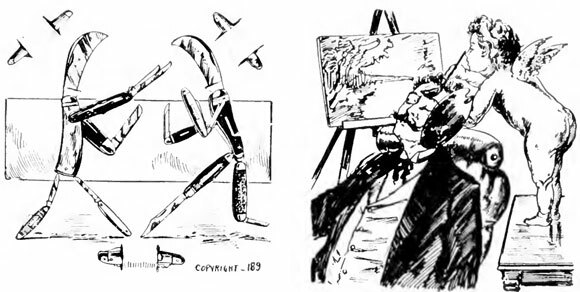 The NYPL Digital Library gallery shows 43 items for Howarth (as of 4 May 2011), including his book Funny Folks (1899). — reminds me of the physical humor of Buster Keaton (who, I might add, was a fan of hardware stores). Maria Dering maintains a blog entitled F. M. Howarth : A Life in Pictures, and has also written an interesting story about Howarth at Urban Scrapbook (in five parts, posted March through June 2009). Alice Hutchins (1916-2009). Magnetic works. Uses materials obtainable from hardware stores, and magnets, to create re-configurable art. Associated with Fluxus. More here and here, where we read about Hutchins’s association with hardware store culture. Creative American Craft Series by Hazel’s guest artists. HA-59. City of Industry (California) : Hazel Pearson Handicrafts, 1977. Editorial and Layout by Irene Zachario, Lynette Eastland and Stephen Van Handel. Hardware sculpture is one of the most unique of the popular crafts! Composed of a wide range of materials, not usually associated with art objects, these sculptures utilize nuts, bolts, screws and nails; things you might use to build a wall, but never hang on a wall! Here we present 5 projects to keep you visiting your workshop, but not to work in it. Inax. Shokunin no mikurokosumosu (The Microworld of the Craftsman : Workplace and Tools), published by the Japanese sanitaryware maker Inax in 1985. 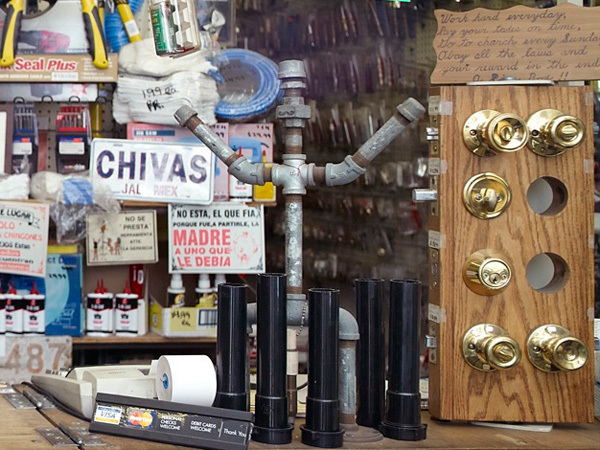 Not about hardware retailing, but its photographs of tools in situ, showing signs of years of use (in some cases) and the close spaces in which their users attend to their craft, day after day, are quite beautiful. The exhibit was curated by Okamoto Shigeo. Essays (rough translation of their titles) and authors : Endo Motoo, The Craftman’s mentality, today and yesterday; Yasuda Takeshi, Craftsmen I’ve known; Naito Masatoshi, Tea ceremony chasen; Endo Toshikatsu, Wood carvers in Takayama; Rokaku Kiji, Workplace of lacquer artist; Murota Takeshi, Post petroleum; Tagi Koji, The body as tool. 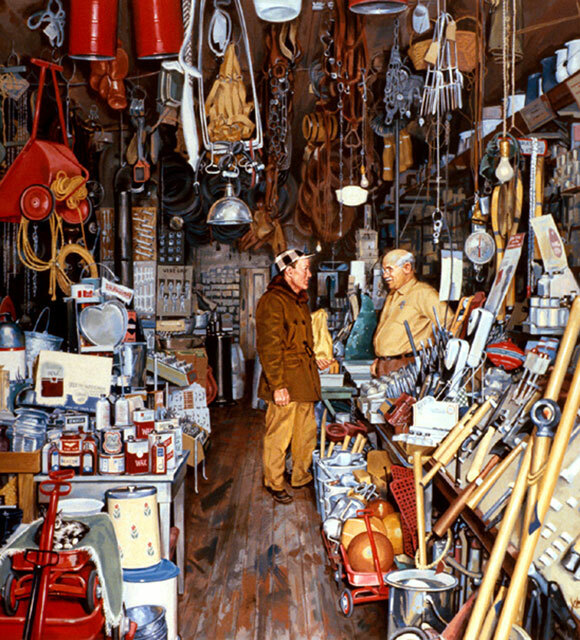 Carol Johnson, a painting of the interior of Wolgast Hardware, in Alta Vista (Wabaunshee County), Kansas. Shown above (with permission) and described here. Wolgast Hardware was in business from the 1920s until 1970. Work done for sculpture class, Montserrat College of Art, Fall 2010. Shown with permission of artist. There’s a lot in the photograph — consider buying one (Chromogenic print, Unframed 11 x 17 in.) in support of CCA here — in order to examine its details more closely. I’m drawn to the altar at the right of the counter, and the prayer atop the display of doorlocks and deadbolts, a couple of which have been removed, presumably to be sold. 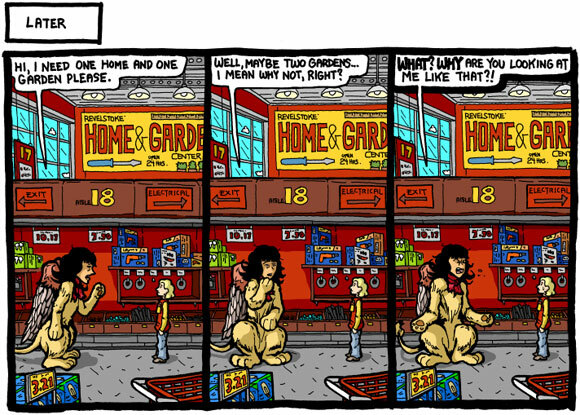 Hardware stores sometimes (always?) have little micro zones or climates, areas with their own little genus loci. It might involve the precision tools and measuring intruments (calipers, say); or boxes of files, or a photo of the old days, or a few avocados brought in by a friendly customer. This photograph captures that. I don’t know what the series or context is for Bravo, although it relates at least somewhat with Opie’s photographs of Los Angeles minimalls. Similarly loving photographs, of shops and their proprietors/clerks, can be seen in Max Galli, Vom Charme der alten Warenwelt (1992), described here. Much more here, at Opie’s Regen Projects page. My first encounter with Opie’s work was her images of freeways; her range (and depth) are amazing. More can be seen at the Stephen Friedman Gallery. A somewhat larger version of the above can be seen at eventseekr (Art Top 5 in the SF Bay Area, Fall 2011). 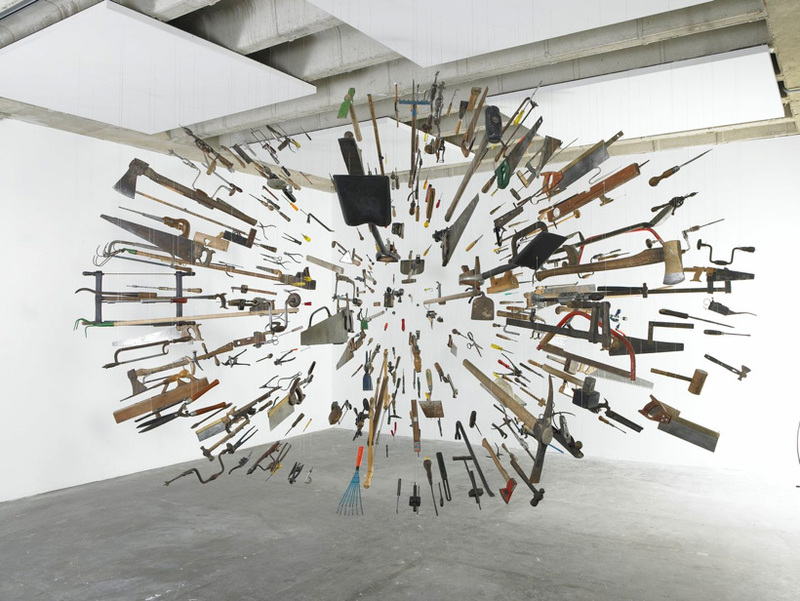 Damián Ortega, Controller of the Universe (detail), 2007. 112 3/16 x 159 7/16 x 179 1/8 in. (285 x 405 x 455 cm) Found tools and wire (artist’s page, at White Cube, here). 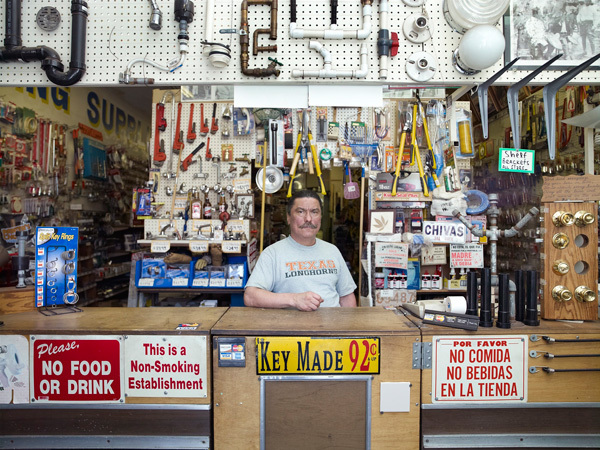 I am the fourth-generation owner/operator of a Hammond, Indiana hardware store, P.H. Mueller Sons. The store was founded in 1887 by my great-grandfather, Paul Henry Mueller (P.H.)... The company has also been involved in other business sectors on-site, including sheet metal work until 1939 and automotive paint from 1940 until 2006... We opened our latest associated feature, Paul Henry’s Art Gallery and Studios in the space recently occupied by the paint store. We are a full spectrum art gallery occupying 7000 square feet of floor in our vintage building. Three seperate and distinctive spaces offer versatile viewing of the art on exhibit. Over 150 artists are represented in a wide range of form, style and media. We host a number of activities including association and club meetings, art classes and exhibit openings, live music and fundraising events. So here is a lovely example of the multiple genres occupied by the hardware store. The owner’s facebook page offers info about shows, and what I can only describe as hardware store humor on its wall; the wall photos album includes some views of vintage tool displays, unchanged since their assembly and arrangement in 1922, as well as photos of events, art, musicians — all the sorts of things that go on there. 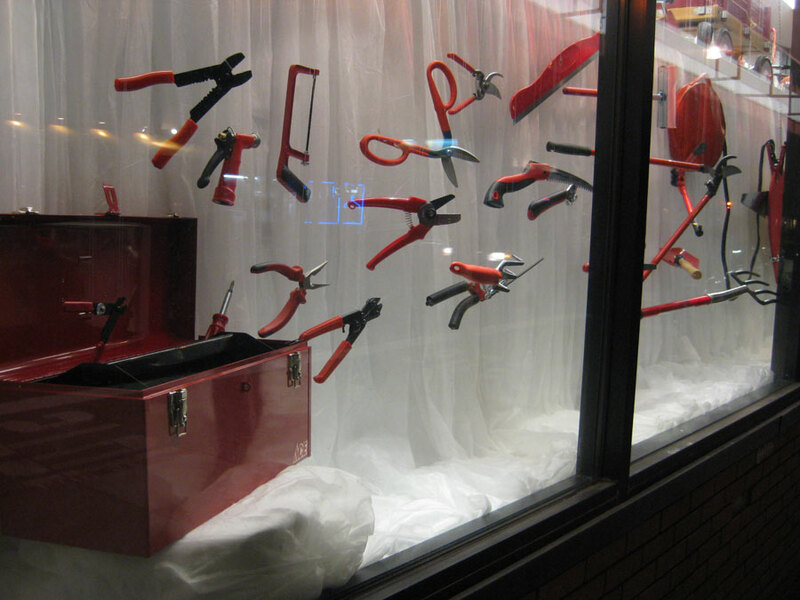 Shown above is of one of the carefully arranged tool displays in the store. It is available as a poster, in several sizes, via P. H. Mueller Sons here. recent (May 17, 2011) profile at Apartment Therapy Chicago. Oh! Is for Orange. oil on panel, 36 x 36 inches. Shown with gracious permission of the artist. This is interesting work, and I suggest a look at the artist’s website here. See also the nice presentation at Skidmore Contemporary Art, where a smart essay on Reemtsen’s work (by Lia Skidmore) can also be found. The paintings feature women in dresses — shirtdresses, party dresses — hard to pinpoint the decade, some amalgam of June Cleaver and Mad Men times. What is shown of the figures is, with a couple of exceptions, shoulder down, ankle up. No heads or faces. In most, the figure holds a tool or gardening implement (watering can, garden hose). All the figures stand (or fall) before a stucco-y textured background. The paintings bear titles, many of these involving a play on words; some are more mysterious. The title Oh! Is for Orange might have been taken from an ABC book, with a slight twist on the O . It — and especially the Oh! as in innocent surprise — suggests something childlike and innocent (or coy? 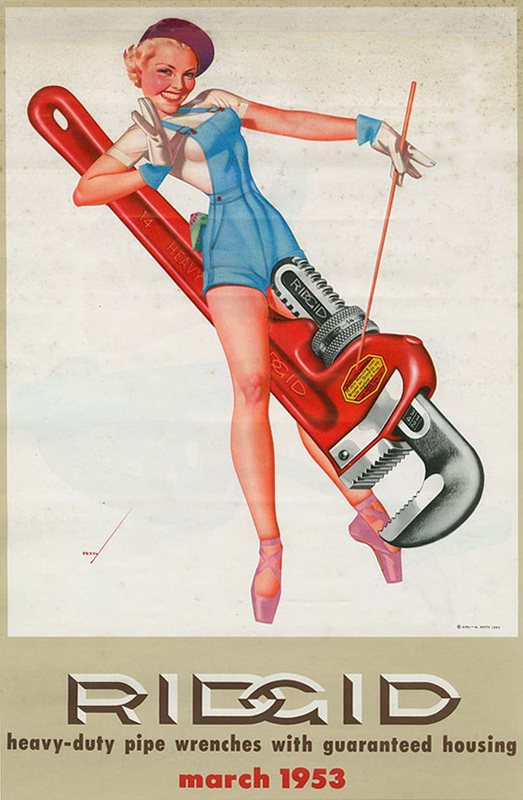 ), possibly sustained by the party dress and bling, but belied by the mature body and, even more so, the pipe wrench. 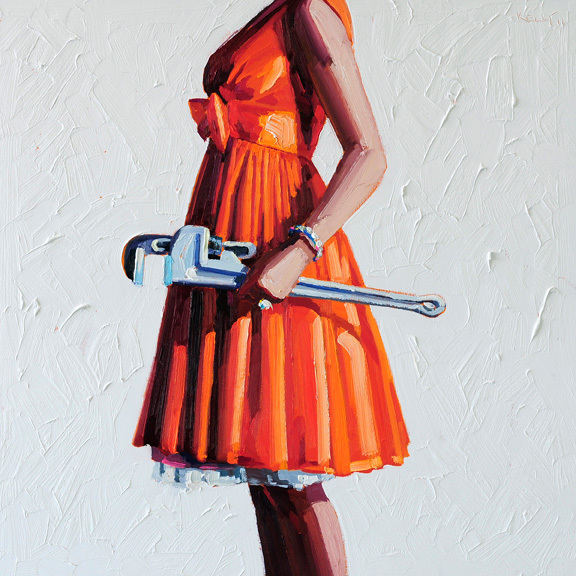 There’s a mixed DNA in these paintings — Ridgid Tool calendar cheesecake girls come immediately to mind, some of them holding pipe wrenches, not to mention reamers, pipe threaders, and other (suggestive) instruments. But other women held tools then (when?) 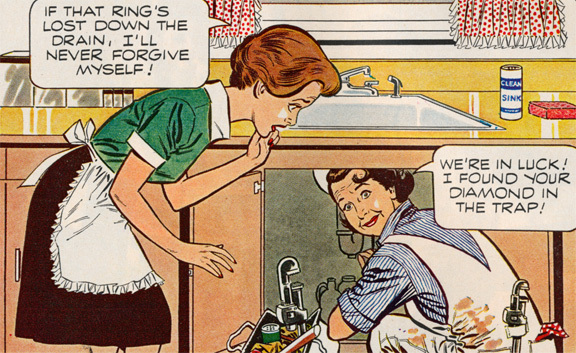 too — housewives, dressed to the nines, effortlessly sponge-mopping a linoleum-floored kitchen. Comet’s Josephine the Lady Plumber. In a previous decade, there’d been Rosie the Riveter imagery. The dresses are seemingly ofthe 60s, 70s, 80s (but I’m no expert). 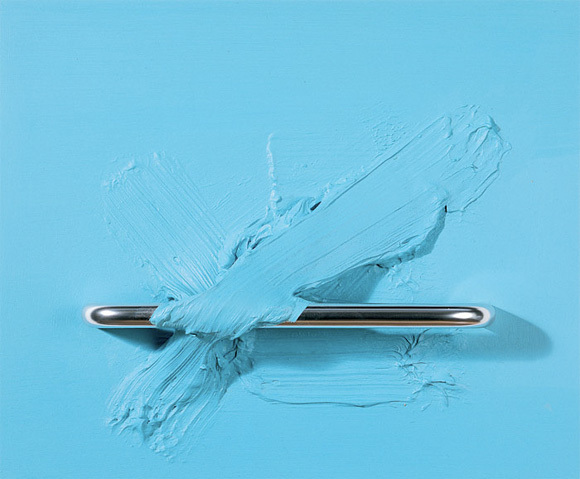 The bracelet and wrist bling strikes me as of our own time; ditto the toned flesh that’s an indirect consequence of the thick, impasto-y strokes that have been compared to Wayne Thiebaud’s dessert paintings. Women didn’t work the ellipticals in the 60s and 70s. George Petty, illustration for Ridgid Tool Calendar, March 1953, this taken from the beautiful scans made available at The Reluctant Paladin (with whose kind permission this is shown here). Detail (minus border), copyright Lizzy Rockwell; shown with permission of the artist. and Hardware Store Lacing Cards (2008?). Shown with gracious permission of the artist. More Subnormality; and something on the artist at about. Stumbled upon via a languagelog post and discussion of the ambiguity inherent in language (and specifically, names). More about the novel — and a scan of the illustration as it appeared as frontispiece — at the Hardware Store Fiction page, here. 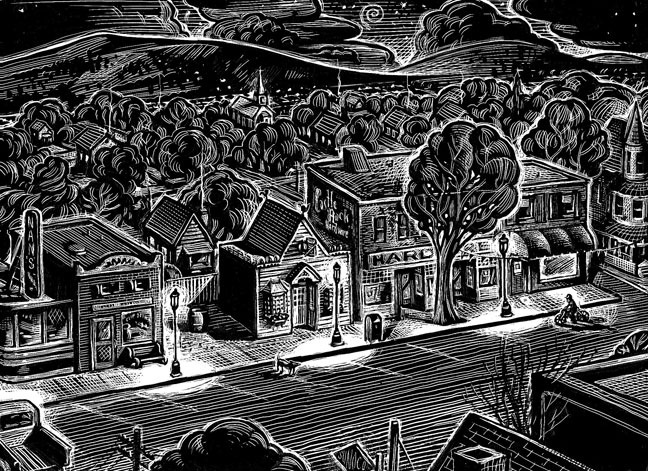 This and other of Bill Russell’s scratchboard illustrations can be seen at his illogator page, here. See also Russell’s billustration and Profile Reportage sites. 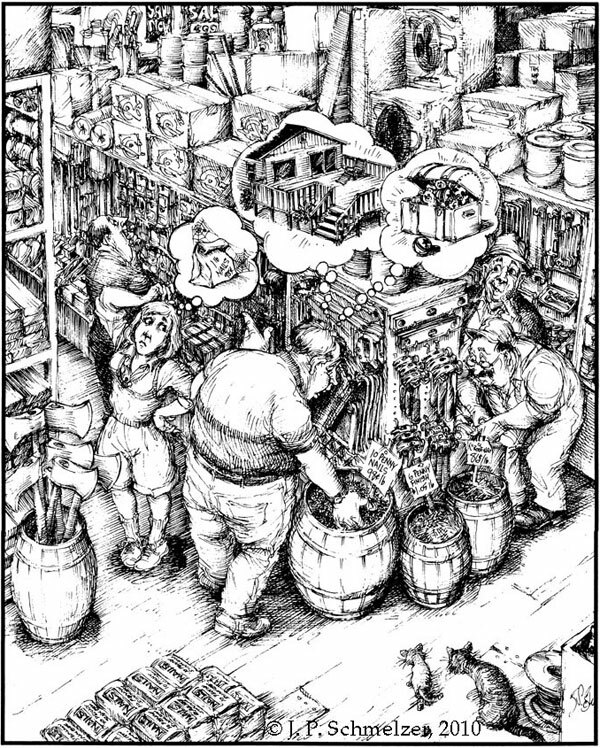 Permission to show this illustration kindly given by the artist, who writes: I like hardware stores myself, especially old ones with wooden floors. One of the best ones I have been in lately was one on Fulton Street, off lower Broadway in Manhattan of all places. It was about 10 feet wide, just wide enough to have some small stuff on each side as you went about 25 feet to the counter, and then everything else came from the back . Schmelzer refers to Fulton Supply & Hardware; his own website is here. Czech artist Katerina Seda’s primary media are her friends, family, and community of her native town Lisen. Seda (b. 1977) uses performance, staged activities, and public interventions to reactivate social concourse as it is the basis for a sense of self predicated on group identification. The Society will present It Doesn’t Matter, a series of over 600 drawings executed by Seda’s 77-year-old grandmother, cataloging in size and type the various tools and supplies sold through the Brno hardware shop her grandmother managed for over thirty years under communism. While therapeutic in intent, the result is a profound reflection on memory and subjectivity as expressed through, rather than in spite of, alienation. Only a few drawings are shown, most images are installation shots. Perhaps the event is more important than the drawings? But some of us come at this via hardware stores. Really nice idea, however. More on this project at Frieze Magazine 107 (May 2007), here. Or scroll down to image from It Doesn't Matter at theartblog (May 3, 2009), which clicks to a good enlargement. This critic finds the drawings oppressive, perhaps because of their tool/hardware subject matter? Sarah Smith. 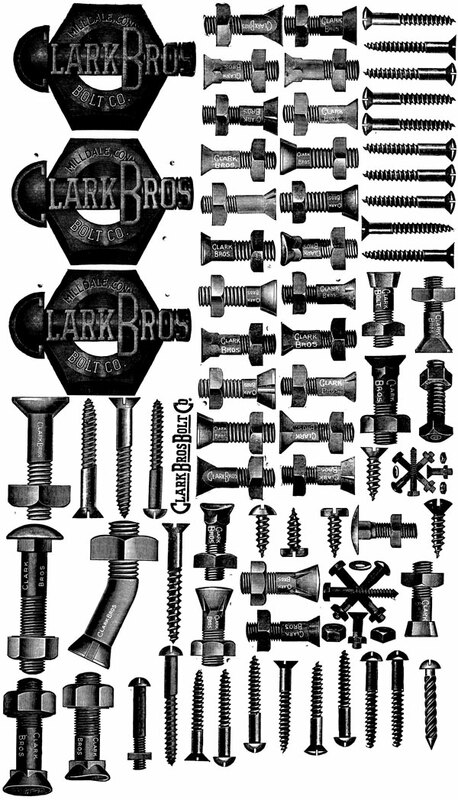 Clark Bros. Bolt Co.
Printer’s cuts — metal plates (in this case copper) mounted type-high on wood. 2011. Image shows approximately 7.5 x 13.5 inches, cropped from sheet approximately 12 3/4 x 18 3/4 inches. Courtesy of Sarah Smith, olfactory press. Beautifully printed arrangement of cuts of bolts and screws, 6 of 18, 2011. Will attempt to identify some of the more obscure bolt shapes, including those with oddly shapped heads (boilers? ), and the screw at bottom right. no links work, or Taylor’s own website requires flash. maintained here for reference. Sherry Thurner. Ace Hardware (Janesville, Wisconsin). Shown here with kind permission of the artist, and more fully described in her interesting book and painting-filled blog sherry-latebloomer.blogspot.com. Something about the lettering brings Ed Ruscha to mind — not so much his Ace (1962), but maybe something like See (1992)? 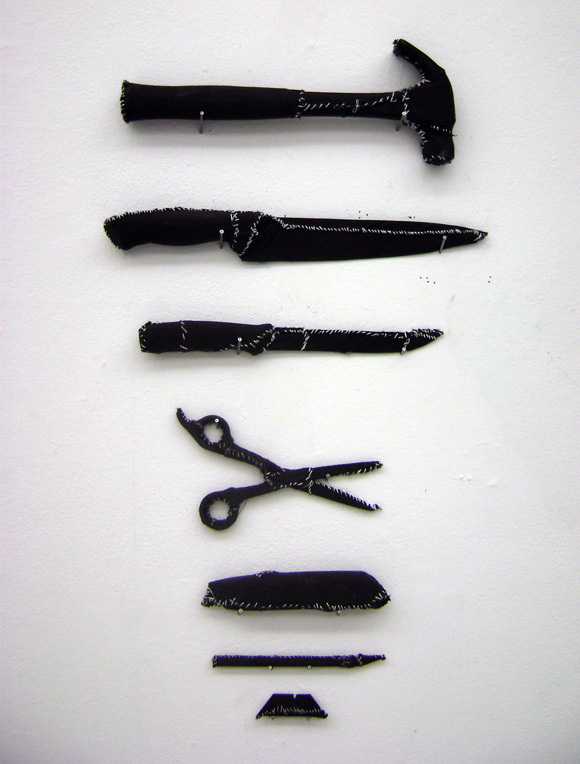 In this interesting body of work circa 2002-05, pieces of hardware (e.g., drawer pulls, pieces of wood) are deployed as obstacles in the surfaces and structures of the support, against which the paint is conceived as a protest. Much (all?) of this work was done in Ireland (Tillyer lives in England), and the essay that appears in the catalogue of Hardware Variations on a Theme of Encounter ( and here ) is in part a reflection on being there (leading to memories of other landscapes, e.g., Southern California’s deserts, as well). The essay is also a long meditation on ways that Tillyer finds to avoid paint’s being a surrogate for some figuration or narrative, without being an expressive mark or gesture. (Of particular interest is an analytical diagram entitled Plan tracing the movement of painting through perspective, paint and construction. ) Hardware and pieces of wood are used in his strategy to move forward. A frontispiece photograph of The American Hardware Store, Caherciveen suggests Tillyer’s engagement with hardware, land and skyscapes on both sides of the Atlantic, but also with American luminist painters (including Frederick Church). That Caherciveen image — originally from a postcard — is shown among the paeans and ubi sunts, here. The artist’s website is beautiful and substantial: showing works but also providing his writing as well. Tillyer constantly changes his own game, working in watercolor, oil, acryic, working with wire mesh, screenprinting, etching. A monograph published in 2000, Norbert Lynton’s William Tillyer: Against the Grain, provides a critical overview. 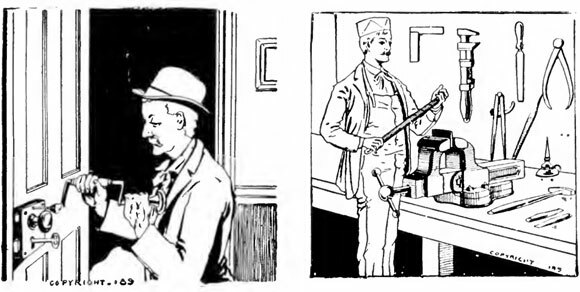 Before Ridgid went to photographs, Cheesecake illustrator George Petty made his mark in this specialty genre. Here, for example, is a flickr set of the 1953 calendar. Columnist Steve Duin of The Oregonian has blogged about this phenomenon here.